Spotlight on: Pages, part of the iWorks suite. Pages allows users to create a poster, a flyer, business cards, envelopes with text, and more. It can produce the model document so that the user can merely replace text, photos and even video with her own In polling the attendees, we found that few were actually using it. Len Adler, who presented, talked about how he got involved with Pages, when a committee he is on got him involved in making a series of posters to promote attendance at a Sunday event about contemporary issues. Before Len got involved, the posters had been straight text about the subject of the program. Len started playing around with inserting images from the Internet, and making headers with a color background, using Keynote, which is also part of iWorks. He moved on to Pages, whichallows the user to really capture the viewer's attention by adding objects or photos, or big graphics and letters. 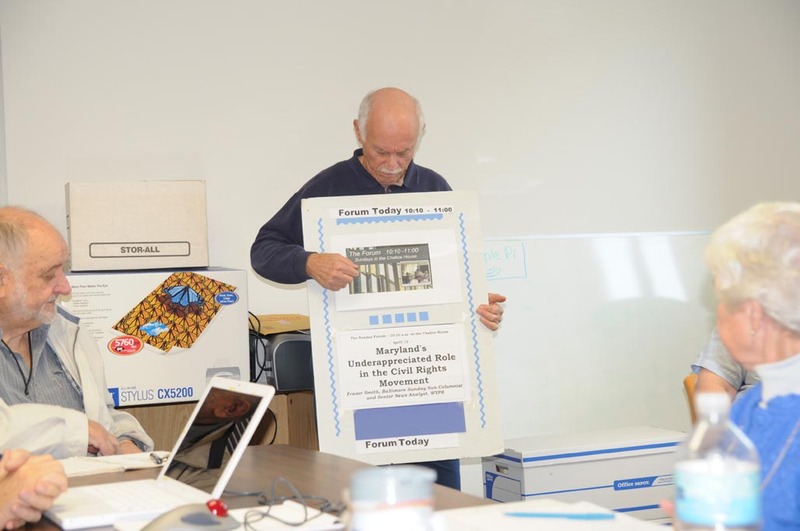 Len showed us a number of colorful posters he had made, and then described how he sent them to the committee for printing, as .pdf files. Len Adler talks about using Apple’s Pages to create event posters. Photo by Richard Sanderson. While a .pdf file cannot be (easily) edited, it is a means of sending a heavily formatted document to others, or posting it for review, via Google documents. This led to a discussion of alphatizing. iWorks software menus include "alpha." This is a means of erasing background or any color in a photo, so that the image can be manipulated and added to another object. Seth Mize demonstrated in Mac OS X 10.5's Photo Booth how much fun it can be to take your photo with a background selected from this application. You can be in the clouds, in front of the Eiffel Tower in Paris, or in any number of other fun places, just by using the magic of this program. 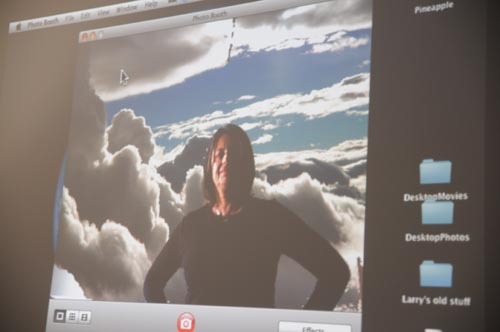 Seth Mize talked about how you can use the “blue screen” effects of Photo Booth to superimpose yourself in the clouds. Photo by Richard Sanderson. Next month we will look at another iWorks application, Keynote. If you've attended a general meeting of the Pi, you've seen the agenda done in Keynote. It is Apple's answer to Microsoft's Powerpoint, and you'll see why it is so easy to make slides and animated posters from it. Because of Thanksgiving, the Retired SIG will have its November meeting on November 20th, the third Thursday of the month. Mark your calendars and join us!